The Long Island Decoy Collectors Association will be introducing a new feature at its 2016 Annual Show. The Show will continue to focus on antique decoys and other sporting collectibles, but the CONTEMPORARY DECOY EXHIBITION will provide a venue on Long Island for those decoys that will become the collectible antique decoys of the future. Like the former U. S. National Decoy Show – which closed its doors in 1994 – this event will offer a showcase on Long Island for carvers who continue to practice this uniquely American art form. The EXHIBITION will strive for simplicity – for both the carvers and for the viewing public. Here is what we are trying in the first year: Just 2 classes of decoys will be displayed on tables and judging will be done by the public. There will be no tank-testing or professional judging. Novice and professional carvers will compete together. As a way of honoring and further displaying every carver’s efforts and talents, each decoy will be photographed individually and posted on the LIDCA website for the following year. The 2 classes will exhibit utilitarian and decorative decoys. The former will join the Al McCormick Gunning Class of simpler, more durable decoys – true hunting decoys. Al was “Mr. Decoy” for decades on Long Island and taught scores of gunners to make their own rigs. The Shang Wheeler Heritage Class will show more elaborate and stylized decoys – “smoothies” with more detailed carving and painting from the most skilled and experienced hands. Charles “Shang” Wheeler was recognized for his exceptional craftsmanship and artistic talents at the original National Decoy Show, here on Long Island, back in 1923. We hope you will participate – bringing birds in person or sending them by mail. And, we hope you will help us spread the word to other carvers. Please contact us directly with any questions. PURPOSE ~ The Contemporary Decoy Exhibition is intended to provide a venue on Long Island for those decoys that will become the collectible antique decoys of the future. Just as Shang Wheeler was recognized for his exceptional craftsmanship and talents at the original National Decoy Show in 1923, LIDCA hopes to showcase the talents and works of decoy carvers who are working today. The Exhibition also strives for simplicity. We want it to be simple for both the carvers and for the viewing public. Thus, we offer only 2 classes and no tank-testing or elaborate judging. Novice and professional carvers will compete together. All decoys will be displayed on tables and judging will be done by the public. Each entry will be recognized with a certificate from LIDCA. Cash prizes – with funds from the Entry Fees – will be awarded only to the two highest-scoring birds, one Best in Show from each class. All entries will be photographed and posted on the LIDCA website following the Show. RULES ~ The 2 classes honor long traditions of decoy-making. Al McCormick Gunning Class will show the simpler, more durable decoys – typical gunning stool. Al was “Mr. 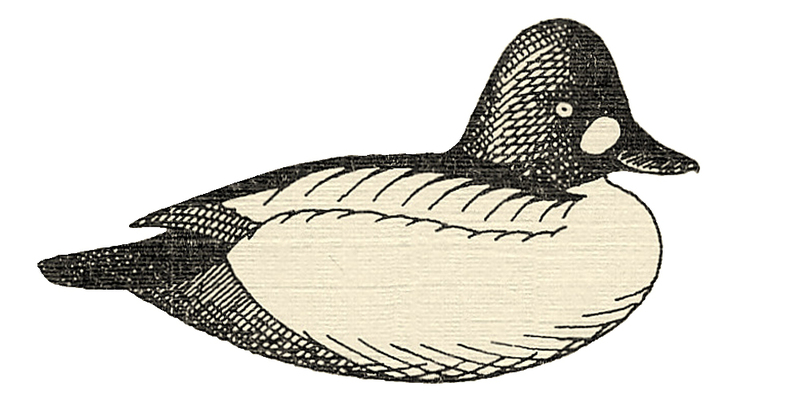 Decoy” for decades on Long Island and taught scores of gunners to make their own rigs – especially of Black Ducks, Broadbill and Brant. So, these decoys – including bills, crests, wingtips or tails – should withstand rough handling. Paint jobs should be readily duplicated with minimal instruction and consistent with the advice from Eugene Connett’s Duck Shooting Along the Atlantic Tidewater: “Remember that it is not the so much the appearance of the bird in the hand but the effect of a half-gunshot off that counts”. Shang Wheeler Heritage Class will show the more elaborate and stylized decoys. These decoys – not super-detailed carvings with no practical use in the field i.e., not “floating decoratives” – will have more careful carving and paint jobs possible only by skilled and experienced hands. Postures can be unusual for decoys but should be floatable. These decoys will honor the traditions of Elmer Crowell and the Ward Brothers, for example, but could also include replicas of true antique decoys. Each Carver will decide which category best fits his or her decoy(s). However, prior to judging, LIDCA officials will be available for consultation and will override the Carver’s decision only if absolutely necessary to maintain the intent of the Exhibition. Materials ~ There is no restriction on materials used in decoys in either category. Just as carvers have long used “found materials” such as refrigerator cork or life-raft balsa, carvers are free to use any wood, cork, plastic, leather, metal, flocking, et cetera. Decoys carved then molded by the carver are acceptable, but only eyes and hardware may be factory-made. Size ~ Decoys should be life-size or oversize. Details ~ There is no restriction on the level of detail but carvers should use common sense to avoid details that clearly exceed the traditions of either class. For example, wings raised off the body and vulnerable to breakage should be avoided. Features ~ Each decoy should have a means of attaching an anchor line (but no line or anchor is required). Each decoy should also bear the permanent identification of the carver – which will be covered with masking tape during the Exhibition. Quantity ~ Each Carver may enter no more than one drake and one hen per species in each class. NOTE #1: The public will be permitted to handle both McCormick and Wheeler decoys so that they may inspect them from any aspect – under the supervision of LIDCA staff. The public will be advised to handle them carefully but neither the public nor LIDCA will be responsible for minor damage such as paint scuffing or scratching – the sort of damage that might occur during hunting use. NOTE # 2: Decoys carved at any time prior to the Show will be eligible to participate in the 2016 Exhibition. However, in future years, the decoy will be required to have been carved since the previous Show. JUDGING ~ Judging will be by ballots submitted by the public, vendors and LIDCA members. Each Adult will receive a ballot when they pay their General Admission Fee to the Show. They will be directed to identify their favorite decoy for each species in both the Al McCormick Gunning Decoy Class and the Shang Wheeler Heritage Decoy Class and also the Best-in-Show for each class. The winners in each species and class will be those decoys that receive the most votes. In the event of a tie, Best-in-Show will be awarded to each of the tied decoys. AWARDS ~ Each decoy that is entered will be awarded a Certificate of Appreciation from LIDCA. These will reflect the Species, the Class and the Year, and will be mailed to the Carver shortly after the Show. The McCormick and Wheeler Best-in-Show decoys will be awarded ribbons at the Show. PHOTOGRAPHY ~ Each decoy will be photographed at the Show. Photographs of all entries will be posted on the LIDCA website for at least one year. At the Carver’s request, contact information can be included in the posting. Fees ~ The Entry Fee for each decoy will be $5.00. Day of Show ~ All hand-carried decoys must be entered between 8:00 and 9:30. All entrants (other than LIDCA members) must pay the General Admission Fee for the Show. Mailed entries must be received between Monday, February 15, 2016 and Thursday, February 25, 2016. Each mailed entry must include a completed Entry Form and a check for the Entry Fees plus Return Postage (including insurance). Each decoy must be insured both ways. Here is a sample of the BALLOT that will be provided to each adult at the February 27 Annual Show. Attendees, carvers and LIDCA members will be eligible to vote. We hope to see you on February 27!